Haha the first time I posted this I forgot to change the intro. Oh well, that is how it goes sometimes. Zane loves lions, his lovey from when he was little was a lion named Judah. This week you can see my failed attempt at a bento gone bad, but also you can see my own craft I created to work with Zane with scissor skills. Lion Bento Lunch Box – I made this and it turned out okay I will share the photo just so you can see one of my project fails. LOL This must have been done with cold mac n cheese. Lion & Lamb Mask – This was great you got two L words in one! Plus this worked well for a bible theme also. 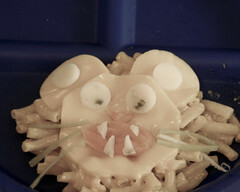 Macoroni Lion – We have actually never done a pasta project before and I thought this was a pretty cute one. Crunchy Leaf Lion – Again a two L project here. I actually believe I have featured this project in the past. But what is great is you can find any image you want trace it with glue and add the crushed leaves. I wanted to use this lion picture and outline the main in glue. But we didn’t make it out to get leaves. Two outings outside, one Zarek fell off a wall and two Zane had an accident. I gave up. 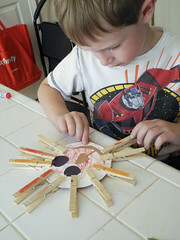 Clothes Pin Lion – I created this craft after learning that clothes pins can help your preschooler with scissor skills. Zane and Zarek were both able to participate in this activity.